It’s exciting times here at MapsPeople! A few weeks ago we powered Mobile World Congress with indoor navigation, and as one big event ends, we move to the next - more specifically, Google Next. 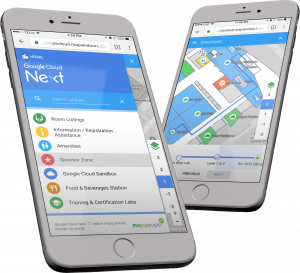 MapsPeople powered Google Next 2017 with indoor wayfinding. It is not the first time that Google has chosen MapsIndoors as their preferred wayfinding solution. MapsIndoors was also used for wayfinding at Google Atmosphere in Tokyo - twice. But Google Next 2017 is on a completely different scale by being one the largest Google events. It was all taking place on March 8–10, 2017 across two venues in San Francisco. Google Next is the place to be for Google Cloud developers, partners and customers. It is a place to learn and get inspired by the tools, technologies and services that Google Cloud is building. Throughout the three-day conference, attendees explored the latest cloud-enabled technology through sessions, workshops, machine learning activities, partner tracks, technical training, and other skill building activities such as hands-on codelabs. Industry experts and Google engineers brought together IT professionals as attendees could choose from over 200 sessions on Google Cloud Platform, Google Maps, Devices, G Suite, and more. The keynote speakers included people like Eric Schmidt, CEO of Google from 2001-2011, Sundar Pichai, current CEO of Google, Marc Andreessen, founder of Netscape, and Vint Cerf, one of the fathers of the Internet. With more than 200 sessions and thousands of attendees, wayfinding would undoubtedly become a problem for many. This was why Google once again chose MapsIndoors for indoor wayfinding at their events. Through the official Google Next webapp, attendees searched for everything from keynotes, workshops, codelabs and every other point of interest. Users were given the best route to their destination based on their current location. It could be from their hotel to Keynote Room L3 at Moscone Center West at 12:30 PM on Day 1, when Internet legends Vint Cerf and Marc Andreessen addressed the past and future of enterprise computing. Attendees also created their own personal program for the day by adding stops along their route. That way they could easily navigate through a tightly packed program. Administrators from Google had full control over their MapsIndoors solution with the accompanied content management system. It allowed them to add temporary points of interest that would automatically disappear at a certain time and date that they had set. This ensured that Google’s indoor map was always up-to-date with today’s activities. We received incredible feedback from everyone at the event; from attendees to Google engineers. The possibility for attendees to always have a great overview of their schedule and the venues added tremendous value to their attendance. If you want to know more about indoor navigation for events, take a look at what we did for Mobile World Congress 2017 right here.